Fort William fire crews had a busy day last Thursday, April 11, when they were twice called out to help rescue a cow stuck in a bog. 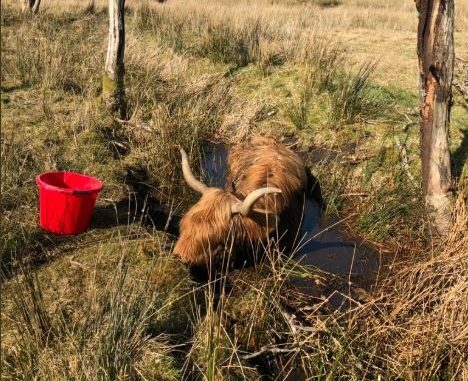 Around 10am, three Scottish Fire and Rescue appliances, one from Fort William and two from Inverness, were called to Kinloid, Arisaig, where an 18-year-old cow named Dolly had become trapped in a bog. After helping crofter Hugh MacDonald successfully dislodge the bovine, the crews left the scene just after 1pm. 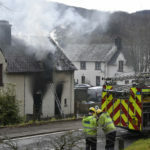 Later that day, at around 3.30pm, two Fort William crews were called out again, this time to help save a Highland cow which was found struggling, trapped in a bog near Steps Cottage, at Canal Bridge, Banavie. This time the crews rescued the stricken animal in just under an hour.